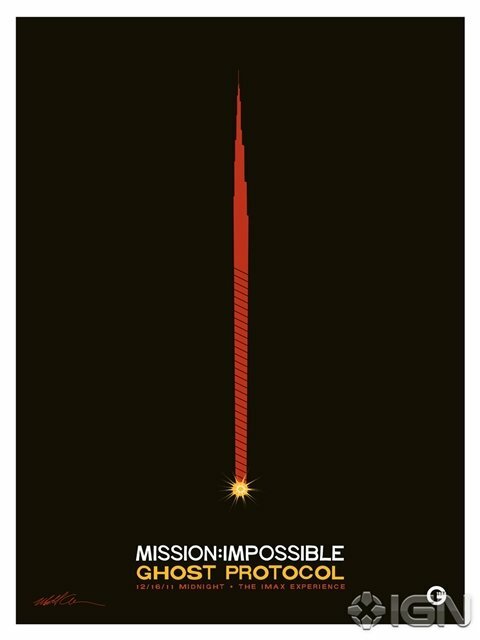 Unsurprisingly, the marketing for Mission: Impossible - Ghost Protocol has focused on the capital-b Big. Moments like the Kremlin blowing up or Tom Cruise dangling off the world's tallest building on the planet. We've seen gunfights, fistfights, explosions, fast cars, gorgeous women, and, of course, Tom Cruise running really fast. The movie is also being released in IMAX, so all those huge moments are going to be even bigger. It's kind of cool, then, that the new poster advertising Ghost Protocol's IMAX release is an exercise in subtlety. IGN got its hands on the poster, and you can check it out below. If the image has you scratching your head at first glance, it's a stylized representation of one of the franchise's most famous visuals, the slowly burning fuse, forming the outline of the Burj Khalifa, the aforementioned world's tallest building. That fuse dates all the way back to the original series that ran from 1966 to 1973, and has returned in all the incarnations since, from the 1988 reboot series to the modern big-screen Tom Cruise outings. Given the tendency for movie posters to go the generic floating heads route, it's nice to see something that keeps it simple and plays with the franchise's iconography. Mission: Impossible - Ghost Protocol opens in select cities and IMAX on December 16th, then goes into wide release on December 21st. To learn more about it, be sure to head over to our Blend Film Database.